And now my work is done. wow, i can admit i did not notice it until just now that is rather a similarity between them now isn’t it lol. Mr. Izzard, whoever that is, has much better hair. BTW, this is quickly turning into That old 90s game based on a play “Six degrees of Separation”. Just another manifestation of the fact that there are really only around 200 people, the rest are just special effects, time echoes, and the like. Scorpius, a search on Youtube for Mr. Izzard may prove entertaining. Also, what a difference accessories and a haircut make. Paul Williams barely even looks like the same guy here vs his 1970s self, and the difference is a startling improvement. -E @12:40 pm – I completely agree, There is something slightly disturbing about that 1970’s picture! 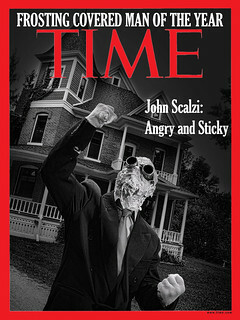 We’re all just delusions of Mr. Scalzi. 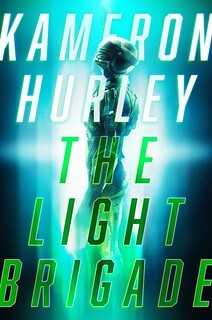 In reality he’s the Last sentient being in existence, trapped on an FTL ship trying to escape the shockwave of the Universe destroying itself, having gone mad from the loneliness. Ok, so when do we get a t-shirt with Axl Rose, Paul Williams, and Eddie Izzard in front of a full moon? Maybe, but how does Paul Williams look in drag? Thank God you are here to make sense of the work to all of us. Please continue. That should have read “sense of the world,” not work. Damn my typing skills. Here’s to Mr. Paul Williams, the pride of Bennington, Nebraska (population roughly 875)! And while he is remembered there, like most talented small town heroes, he got out of there at an early age. John is reversing this trend. thanks for the pictures, by the way. And I mean no insult to Mr Williams. The Town was small, his fame is great. Lila at 12.00, British understatement? But I will agree that Eddie Izzard and Paul Williams are wonderful elves. Cake or death! Oops, I didn’t know it would implant the video above; I thought it would just be a link to the video. If problem, please remove and sorry about that. Wow, we’re all being replaced by clones, aren’t we? Um…I don’t think anybody’s gonna mistake one for the other. Scorpius @ 10:45am Google did a study recently; they’re claiming now it’s only 4.5 degrees of separation. I personally think Eddie Izzard looks more like Mark Schlereth. But then I watch a lot of ESPN. Izzard in a suit and tie – hell, Izzard in men’s clothes – never fails to freak me out. Which in turn means Scalzi is just a Ben Bova Character. I think that’s the first time I’ve seen a picture of Eddie in a men’s suit. Very interesting…a photo of Paul Williams who doesn’t look like the Paul Williams we remember, and a photo of Eddie Izzard who doesn’t look like the Eddie Izzard we’ve seen on stage. It’s cognitive dissonance day! That said, where did Paul Williams get those glasses? I’d like a pair of those. 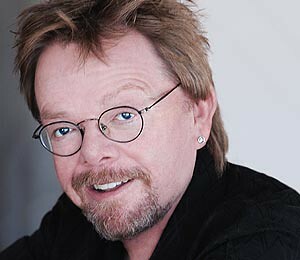 Is it just me, or does Paul Williams look like he’s beginning to grow a mullet? And the question must be asked, have they ever been seen in the same room together? Are we looking at the real life version of Clark Kent/Superman here? Just take off those glasses and. . .
Wow! 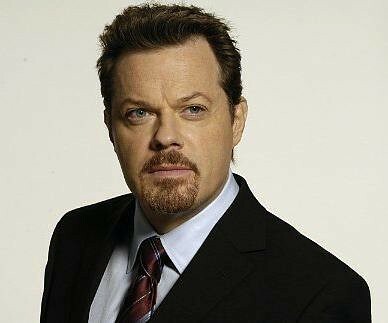 That picture of Eddie Izzard had me thinking that I was thinking of another guy named Eddie Izzard. Googling Izzard turned up a note that he was warned by the UK Dept. of Trade & Industry for recycling material from his DVDs in his standup act. Really? I admit I’m one of the Americans who doesn’t quite get this. When Monty Python reused some of their TV material for “Live at the Hollywood” were we being cheated? I will contest this not. > “Live at the Hollywood” were we being cheated? version of the FCC told them that would be the last time they would do that. This one wet. This one is wet. This one is wet.